ADDIS ABABA, Ethiopia, August 13, 2010 (ENS) – The first use of stone tools and consumption of meat by human ancestors occurred almost one million years earlier than previously known, an international team of researchers announced Thursday. Working in Dikika, Ethiopia, the scientists have discovered bones that show human ancestors were using stone tools and consuming the meat and marrow of large mammals roughly 3.4 million years ago. Dr. Zeresenay Alemseged of the California Academy of Sciences in San Francisco, California and Dr. Shannon McPherron of the Max Planck Institute for Evolutionary Anthropology in Leipzig, Germany say their discovery provides the first evidence that these behaviors can be attributed to Lucy’s species – Australopithecus afarensis. The Dikika Research Project was founded in 1999 by Alemseged, an Ethiopian paleoanthropologist who chairs the Anthropology Department at the California Academy of Sciences. While working in the Afar region of Ethiopia, the Dikika Research Project scientists found bones bearing unambiguous evidence of stone tool use – cut marks made while carving meat off the bone and percussion marks created while breaking the bones open to extract marrow. Until now, the oldest known evidence of butchering animals with stone tools came from Bouri, Ethiopia, where several cut-marked bones date to about 2.5 million years ago. The oldest previously known stone tools, dated to between 2.6 and 2.5 million years ago, were found at nearby Gona, Ethiopia. 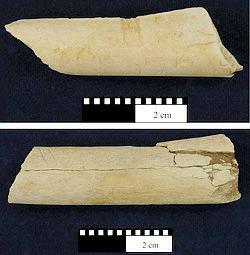 The new stone tool-marked fossil animal bones from Dikika have been dated to approximately 3.4 million years ago. They were found a few hundred meters away from where Alemseged’s team previously discovered “Selam,” the name assigned to “Lucy’s baby,” a young Australopithecus afarensis girl who lived about 3.3 million years ago. 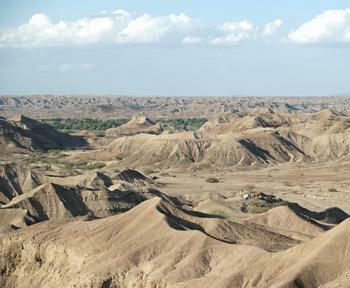 The Dikika bones were found in the Andedo drainage, a natural gully system. The location and age of the stone tool-marked bones indicate that members of the A. afarensis species made the cut marks. “The only hominin species we have in this part of Africa at this time period is A. afarensis, and so we think this species inflicted these cut marks on the bones we discovered,” said Alemseged. Both of the marked bones came from large mammals. One fossil is a rib fragment, the other a femur shaft fragment. Both are marred by cut, scrape, and percussion marks. “Now, when we imagine Lucy walking around the east African landscape looking for food, we can for the first time imagine her with a stone tool in hand and looking for meat,” says Dr. McPherron, archaeologist with the Dikika Research Project. “We can very securely say that the cut-marked bones date to between 3.42 and 3.24 million years ago, and that within this range, the date of the bones is most likely 3.4 million years ago,” says project geologist Dr. Jonathan Wynn from the University of South Florida. To determine the age of the bones, Wynn relied on a well documented and dated set of volcanic deposits called tuffs. These same tuffs were previously used to determine Selam’s age and are well known from nearby Hadar, where Lucy was found. The new find site is located in a drainage that contains only deposits older than a tuff securely dated to 3.24 million years ago. Below the find site is another tuff dated to 3.42 million years ago. This makes the age of the bones between 3.42 and 3.24 million years ago, but because the cut-marked bones are much closer to the lower tuff and below several other horizons, whose date can be estimated, the bones’ estimated age can be further refined to 3.4 million years ago. Microscope and elemental analysis using secondary electron imaging and energy dispersive x-ray spectrometry demonstrated that these marks were created before the bones fossilized, eliminating recent damage as the cause of these marks. While it is clear that the australopithecines at Dikika were using sharp-edged stones to carve meat from bones, it is impossible to tell from the marks alone whether they were making their tools or simply finding and using naturally sharp rocks. So far, the research team has not found evidence of stone tool manufacture at Dikika from this early time period.